Getting down on one knee and asking someone to marry you isn’t a decision that most people make overnight. It takes weeks, if not months or even years of planning and saving to make it the perfect moment, and one that will be remembered forever. And because of this, there is a lot of pressure on the individual proposing to get it right, but oh boy, do some of them get it wrong. The funniest proposal fails usually happen when there has been a grammatical error, lack of punctuation, or a spelling mistake, and instead of asking their girlfriend to marry them, she has to try and decipher some sort of weird code. Then, there’s also the awkward spots that people decide to pop the question; and let this serve as a word of warning to all men thinking the loo is a great place to ask someone to get married. It’s not. Below are 15 hilarious proposal fails that will make you cry with laughter. Asking someone to spend the rest of their life with you is not a decision you make on a whim, it’s also something that, for most people, takes a lot of planning and preparation. So you can imagine the disappointment that this person must have had after paying good money to get a cake made for his girlfriend, only to have had the baker desperately fail with the message. This cake was meant to read, "Wendy Lu, will you marry me?" But the baker decided to include the instructions on the cake too. Let’s just hope Wendy Lu was so distracted by the angel riding a carrot that she didn’t even pay attention to the spelling mistake. I know, I’m also at a toss up for which is worse. Personally, I don’t understand the point of public proposals because it would be so embarrassing having strangers watching and clapping for you; especially if the person asking gets rejected. However, some people think marriage proposals are meant to be done with grand public gestures, like this one, and this is also a reminder that you cannot rely on anyone else other than yourself to get something right. The man behind this proposal enlisted the help of six people (who hopefully are members of their family, not just random strangers) to hold up signs asking Brittany to marry him. Those six people had one job, and still, they managed to get it wrong and stand in the incorrect order because now the question reads “? me marry you will Brittany.” Oh dear! Elaborate marriage proposals which take years to plan and hundreds, if not thousands, of dollars to execute are not for everyone, in fact, it’s usually the simple ones like this that mean more. So, what better way to propose than to spell out the words “marry me?” on your girlfriend’s bed? Except if this list proves anything it’s that proposals can go horribly wrong, especially when the person behind it didn’t get the best English grades. Instead of asking his lady to marry him, this man instead asked her if she will “merry” him. Maybe she’s going to be really happy after this and make him merry, let’s just hope she’s not a school teacher or a writer who would be completely put off by his attempt to spell out incorrect words with rose petals. 12 Do You Marry Him, Honey? Is this the worst engagement proposal fail you’ve ever seen? For starters, it’s on what looks to be a bed sheet, but that’s not the worst part of this marriage proposal, what is, is the awkward sentence construction. When you finally want to ask the love of your life to be with your forever, don’t say to her “do you merry me?” because there’s a good chance she will be in fits of laughter instead of tears of happiness. This proposal happened in Vladeni, Romania, after the bride-to-be landed from a propelled glider flight, and because of the country that this proposal took place in, there is a possibility that English is not this couple’s native language. There's a simple solution to this, why not pop the big question in Romanian? You don’t have to spend a lot of money making an engagement proposal memorable; you could make a nice dinner and surprise your girlfriend (or boyfriend) with flowers, or you could present them with a box filled with chocolates and a romantic poem, but your chances of getting a “yes” are drastically reduced when you attempt to go this man’s route. He decided to ask Naomi to marry him with graffiti on the side of the wall (it’s not even skillful) and while we can’t know for sure if it was her who wrote that gigantic “no” next to the message, it seems unlikely that Naomi was thrilled about having her name sprawled over a wall. A wall that is tainted with water damage and moss, might I add. There’s no right or wrong way to ask someone to marry you, but there are some proposals that seriously lack creativity and imagination. Take this proposal for example, because it must have come to the guy within two minutes (so he didn’t spend any time trying to make it a romantic gesture). It’s safe to say she would get a surprise when she saw this message, but is it really the good kind of surprise? Well, the silver lining is that if she said no, then at least she got a free dinner out of it. Of all the engagement proposals, this is the least romantic and the biggest fail. There's a good chance those woman’s tears are tears of sadness because if my boyfriend asked me to marry him in a public bathroom I would be so disappointed. 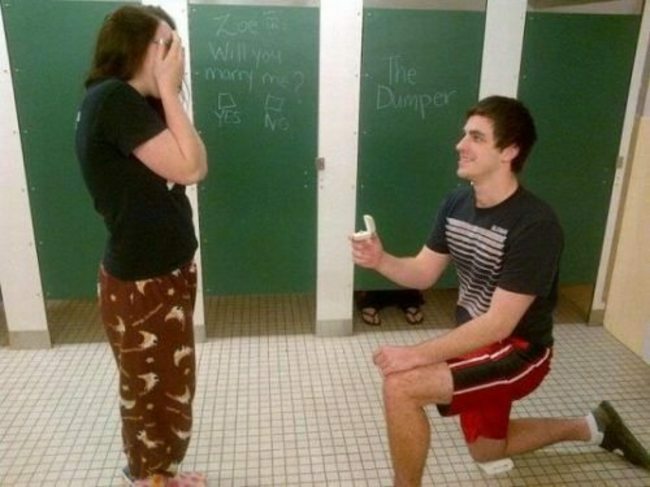 But this really happened because the man in this photo decided it would be a good idea to sneak into a women’s bathroom to ask his girlfriend, who must have just finished up in the toilet, if she would marry him. He even popped the question on the stall of the bathroom door. Why, just why? I don’t care how lovely he is, this is an awful way to start an engagement, and there is even someone doing their business in a stall while the proposal goes down, you know, just to add to the ambiance. If you’re about to ask someone to spend the rest of their life with you, it probably shouldn’t start off with an ugly tattoo, and if ever there was a moment to think before you ink, it should be this one! The thing I find most confusing about tattoo marriage proposals is that they leave a little box for the girl to tick yes, or no. Um, whatever her answer is going to be can you imagine how awkward it must be to then go back and get the little box checked? And what if the answer is a no? Then is this guy is going to have this hideous reminder of the failed relationship on his arm for all to see? That’s going to make getting over your ex a whole lot harder. You’ve been planning to surprise your girlfriend when she heads over to your apartment, so you get the candles, beautiful pink and red flowers, and you spend a good ten minutes arranging them perfectly so when she walks in the door she will be greeted by a message she will never forget. Yes, I’m talking about “Will you maary me?” Oh wait, what? It’s obvious that this guy meant to ask if his girlfriend would marry him, but instead of the most common mistake of replacing the “a” with an “e” (as in "merry") he decided to be on the safe side and double the “a” action. It may be a fail, but he had the right idea and you have to give the person behind this some credit for their effort because it sure beats a graffiti proposal, or one in the middle of a public toilet. 6 Does He Really Expect Her To Say Yes To This? It’s not romantic presenting your girlfriend with a pizza asking her to marry you, but it’s even less romantic when you decide to ask her to marry you on the back of your car. The goal of an engagement proposal is to surprise the bride, and she was probably very surprised by this, but that’s because she felt so disappointed that her boyfriend didn’t go to more of an effort to make this a special moment. Sure, overly grand gestures are a waste of money and they’re not for everyone, but a few flowers or something in addition to this scribbling on rear window may have been nice. The good news is that at least this message wasn’t written in dust, so we can be thankful that the guy at least decided to wash his car before he popped the big question. I will never understand why a man chooses to propose to his girlfriend in a language that is not his own, and more than that, why anyone would choose to propose in an airport, surrounded by hundreds of other people. However, this Turkish man had a legitimate excuse for trying to propose in English because he was dating a British woman, and when she flew into Milas-Bodrum Airport he was waiting. He had taken the time to arrange candles and flowers in the arrival hall to spell the message, “will you merry me?” Imagine walking into that surprise? More importantly, imagine actually get the approval from airport security to set up candles everywhere to make a proposal. It may have been a spelling fail, but I’m pretty sure he got the answer he was looking for. When you get engaged over a table of rice it’s not really the most romantic setting, especially if your initials spell out something hilariously awkward. This couple probably really wish they had given their engagement photo a little more thought because now they are left with a viral image, one that everyone cries with laughter every time they see -- and as a side note, why would you want to spell out your initials with rice?! Also, a word of warning, if you manage to see the couple’s faces seated around them you’ll know how awkward public proposals are for so many people. Just don’t do it. Stick to the comfort of your own home where you can ask your girlfriend to “merry” you without the gaze of the public. 3 What Says I Love You More Than A Message On A Cow?! I’ve said it before and I’ll say it again, no special event should depend on children or animals because there’s a chance it won’t turn out the way you want it. Or it will turn out like this, which is sadly exactly what this Irish farmer wanted. Was this his bride's favorite cow, you ask? Does she really like burgers and he decided to skip a few steps? Actually, we have the answers because this proposal became viral for its...er… uniqueness?! According to Irish Central, this cattle farmer decided to ask to ask his girlfriend of three years to marry him with the help of one of his favorite cows, and when she walked into the shed (he had told her he bought her a small calf) she was reportedly shocked to find the message there waiting for her. She said yes, so she must really love the guy. Let’s hope that when most people decide to pop the question they receive a warm and excited reaction, but if the look on this girl’s face is anything to go by she was seriously unimpressed with the way her man decided to ask her if she would spend the rest of her life with him. He looks happy about the whole thing, and when he got the shirt made he at least went to the care of ensuring the spelling is correct, but he must really not know his girlfriend (assuming that’s her next to him, otherwise this photo is even worse) if he took her on a ride she doesn’t even enjoy. Romantic? Definitely not, but he gets ten out of ten for effort. It’s a beautiful thought trying to impress your partner when you ask them to marry you, but maybe instead of trying to go so big, some men should worry about the spelling, grammar, and punctuation in their proposals. A farmer named Loren from Deer Park, Washington, decided to ask his sweetheart Jody to be his wife by ploughing a 200-acre field. His message was meant to read, “Jody will you marry me? Loren.” But it turned out he misspelled her name by accidentally writing the “J” backwards so it read “Lody.” LOLdy is more like it! It must have been pretty hard to plough all these letters into the field, and this woman obviously appreciated the gesture because Loren told a local news outlet that she decided to marry him anyway.